Promate Scuba Diving Gauge Console Tank Pressure Depth temperature (Made in Italy) by Promate at MZ Italia. MPN: GP200. Hurry! Limited time offer. Offer valid only while supplies last. 5000psi/350bar tank pressure gauge. Quality brass housing and copper beryllium bourbon tube. Convenient Fahrenheit/Celsius temperature gauge. 5000psi/350bar tank pressure gauge. Quality brass housing and copper beryllium bourbon tube. 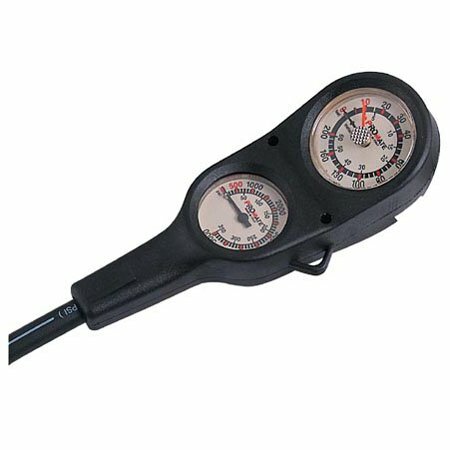 200'/60m altitude adjustable depth gauge with a maximum depth indicator. 32'' hose with standard 7/16'' fitting.